“Winter Cabin” was embossed in black on white card stock and brayered with a sponge brayer using a Peacock (rainbow) Brilliance stamp pad. This was layered over glossy black, cranberry and white card stock. Card by Margaret Wiggin. 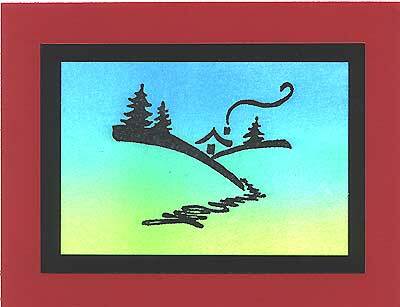 Next post: Holiday Season Card Using Tall Fir, Lg.